Our blog post details a software bug in the Antidote suite, which causes the software to continuously try to reach a network file share on the local domain using a known subdomain name. This software, used as a self-learning spellchecker, is popular and commonly used in most companies conducting business in French, meaning we often assess environments where this software is heavily deployed. Attackers are able to abuse the weak default access control on the Active Directory Domain Services to register this known subdomain, and making the record point to their machine. By doing so, every time Antidote is fired up, the process attempts to reach the network file share on that subdomain, thereby forcing the operating system to authenticate against that machine, which then points to the attacker's machine. A constant stream of authentication attempts coming from all users with Antidote installed are then received by the malicious actor, who would then be allowed to perform NTLM relaying attacks or crack the received hashes.Using the details in this research meant the intrusion testers could reliably obtain and relay authentication hashes for most employees of an organization in a passive, non-intrusive, and timely manner. The NetSPI post explained how, by default, all members of the "Domain User" group are able to create arbitrary DNS records under the main zone of the Domain Services. Since we had been recommending that our clients disable LLMNR and NetBIOS name resolution in their environments for years, we took particular interest in this blog post, given that its content could potentially allow us to go beyond Local Area Network name spoofing. For the rest of this blog post, we will use the fictive Active Directory Domain company.int. Another protocol which will ask neighboring hosts on the Local Area Network for an answer. This type of response can also be spoofed by hosts in the same broadcast domain. Why is this information pertinent in any way? When trying to read from a UNC path, Windows will perform an NTLM handshake with the target, meaning a challenge-response will be performed between the requesting machine and its target. As an attacker, if we are able to have machines in the domain perform authentication attempts against our machine, it allows us to intercept the authentication attempt, and potentially abuse it in order to either obtain their cleartext credentials or to relay the authentication to a 3rd machine. Abusing the authentication process is not difficult, and is outside the scope of this blog post. Once a remote machine tries to authenticate against our machine, we are able to use tools like Hashcat or John The Ripper in order to obtain the cleartext representation of the victim's password. Should that technique fail, either because the password complexity is too strong, or because you don't have a fancy cracking rig, attackers can still perform NTLM relaying. With NTLM relay, we use the hash we capture from the NTLM challenge-response and relay it instantly to a 3rd machine under the same domain (or forest with appropriate trusts). Relaying allows the attacker to authenticate against any service in that domain, under the context of the victim. This can be used to access sensitive information, like the victim's emails, file servers, and sometimes even remote code execution if the victim has Local Administrator rights on the machine an attacker is relaying against. From this point on, all machines running Antidote will constantly try to authenticate against our attacker machine on 172.24.0.5, allowing us to crack the hash or relay the authentication. To demonstrate the reliability of this scenario, we used this technique on one of our clients, where approximately 90 provisioned endpoints were running Antidote. We registered the PLUG-INS record and made it point to one of our machines where Responder was running in analyze mode. In analyze mode Responder does not perform any spoofing, it simply listens for inbound connections and saves the hash. We plotted the results, showing how easy it is for an attacker to passively collect hashes from all domain users over time. 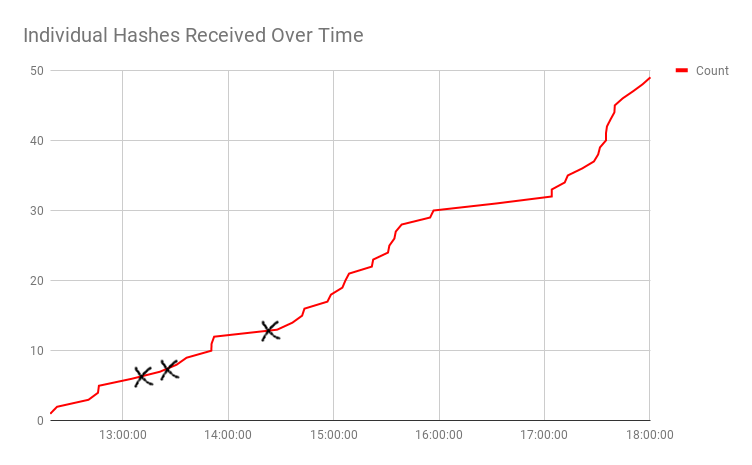 After creating the record, at around noon, we can see a steady and linear amount of collected password hashes. The multiple black X marks represent the time of day we obtained hashes for high-profile accounts (1 account member of the Domain Admins group, 2 members of an OU with access to sensitive information). We reported the software bug to Antidote in December 2017, more specifically, the fact that the PLUG-INS LLMNR/NBNS broadcast could be spoofed in order to capture hashes. We also theorized that it might be possible to force Antidote to load our malicious plugins, which would allow remote code execution. They promptly replied with the details of their investigation, which confirmed the plug-ins broadcast bug. 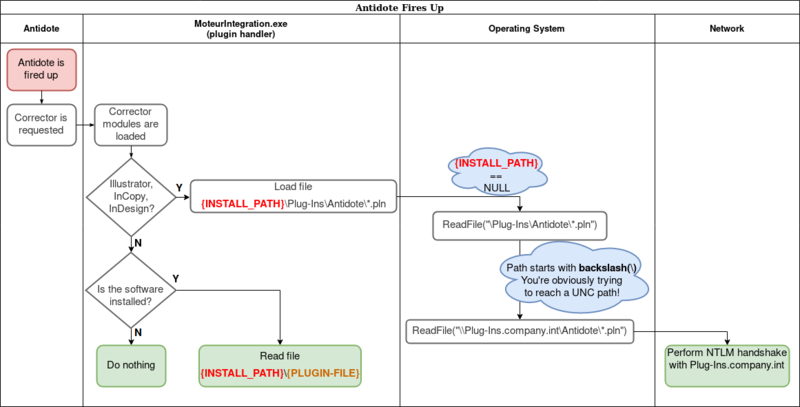 Druide was also able to prove that it is not possible to force remote Antidote instances to load malicious plugins. Indeed, the plugin update process will only call GetFileVersionInfoA() on the DLLs, which does not lead to remote code execution. Druide also wrote that they would eventually fix this bug, in due time, but that it is not a critical issue to them. We waited for a fix. Late last year Druide released Antidote version 10. Earlier this month, we confirmed that the security issue is still present. We sent Druide a draft version of this blog post and the impact was clearer to them. They quickly published updated versions of Antidote 8, 9 and 10 fixing the issue. We advise users of Antidote to update right away using the built-in self-update capability of Antidote. This is obviously a two-fold issue. First, we have faulty software on endpoints which tries to connect to a network share, which, in turn, broadcasts user credential hashes. Second, we also allow users to create DNS records which increases the exploitability and impact of the faulty software. We will look at how to mitigate both vectors: the endpoint and the Domain Services. The Domain Services ACL can be hardened to prevent domain users from creating arbitrary records. This can be done by changing the security configuration for your DNS zones. On the server on which the service Domain Service is running, open the DNS Manager, and for each domain zone under which users are joined, remove the "Create all child objects" permission from the "Authenticated Users" group. An alternative mitigation technique would be Kevin Robertson's method of sinkholing the record by making it point to a dummy record5. If your environment is not already rid of LLMNR and NBNS broadcasting, you should definitely create a plug-ins record and make it point to an A record that does not point to a machine, such as 0.0.0.0. This is important because if your users still perform LLMNR and NBNS requests, should the DNS query not return a record, the operating system will fallback to these legacy protocols which attackers will be able to spoof. If LLMNR and NBNS broadcasting are mitigated in your environment, there is no real value in creating a DNS record for the entry. A more straight forward way of making sure no machine resolves PLUG-INS.company.int is to use the Global Query Block List, a lesser-known feature of the Domain Services. This feature was added with Windows Server 2008 and acts as a blacklist of records that should never be resolved. The Global Query Block List is enabled by default and contains two blacklisted records, ISATAP and WPAD. To check whether you are using the Global Query Block List, run the command dnscmd /info /enableglobalqueryblocklist on your DNS server. Should the command return Dword: 1 (00000001), then your Domain Services uses the Block List. To list the records, run dnscmd /info /globalqueryblocklist. Once the entry was added to the Block List, the plug-ins.company.int will never resolve it again, even if a record is created. Site-wide deployment may mean the end user will not have the ability to perform updates. If you see that you are using a vulnerable version, contact your IT department. Since the bug is only triggered when the Illustrator, InCopy, or InDesign software isn't installed on endpoints, the plugin can be safely used if they are installed. The problem discussed in this blog post is a two-sided problem. 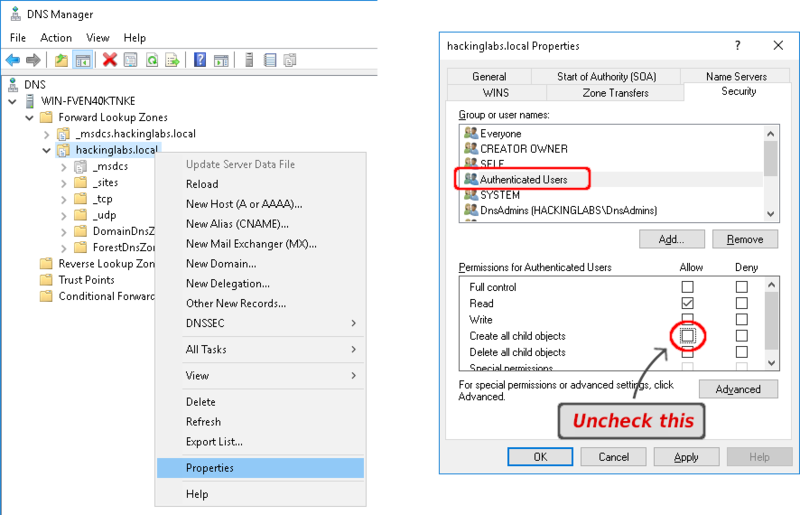 We visited a weakness in the default access control configuration for Active Directory Domain Services that allows all authenticated domain users to create DNS records under their respective zones. To illustrate the impact of such poor access control, we needed a concrete, widely abusable use case. We presented the case of Druide's Antidote software, for which some plugin handlers continuously attempt to reach unexistent network shares at a prefixed subdomain. By registering this subdomain with an unprivileged domain account, we were able to demonstrate that we could reliably obtain NTLM hashes for all employees using the Antidote software, and relay them. 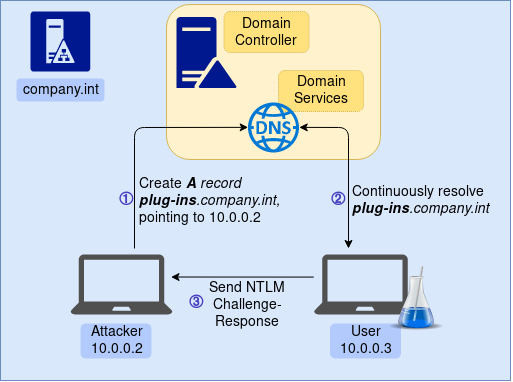 Since we drafted this blog post, NetSPI released another blog post about different abuses and mitigation around Active-Directory' DNS. We advise defenders to take a look. The Antidote bug was discovered and disclosed to the vendor by Martin Lemay. Further analysis performed by Ian Bouchard, Philippe Arteau, Louis-Dion Marcil and Olivier Bilodeau.